BusTalk :: View topic - Destination photos needed! Posted: Thu Jun 08, 2017 12:52 pm Post subject: Destination photos needed! I am looking for photos of the original split destination signs used on the original batch of 1959 TDH-5101's (1-180) for a special project. 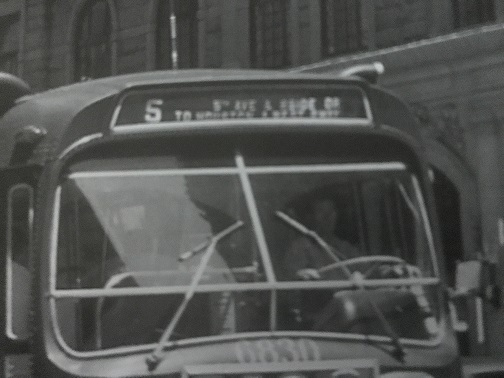 These had the route number followed by the route name with the destination in small fonts below it. PLEASE don't submit photos other than what I'm looking for. Thank you! You mean TDH-5301, don'tcha? And wouldn't they have only used one rollsign on front, with the layout as you mentioned? 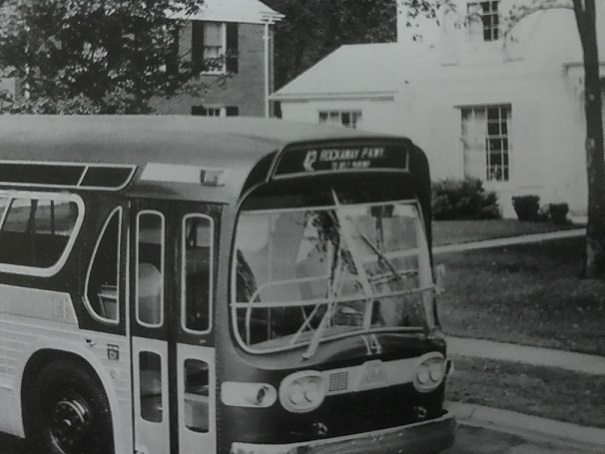 As for "split" rollsigns (two on the front, one in black at left and one in red at right), that was held by Fifth Avenue Coach Lines and its Surface Transit subsidiary, on their batch of "Fishbowls" (FACL experimental air-conditioned 1-10, FACL regular 3101-3160, and ST 3161-3220). Also, wouldn't the original rollsigns have been among the first to be made by Transign, with them being mylar? Or were they still using cloth rollsigns at that point? Other than those minutiae, good luck . . .
You are absolutely correct - TDH-5301. By split, I mean vertical split (route over destination). These were the original format used on the first group of NYCTA fishbowl. And I do believe that these were mylar. BTW, Any reason why I'm having trouble attaching files? All are below the max filesize, but message says the maximum filesize for all attachments is reached. I did get a PM about this but I took it as couldn't post anything. I asked for more information but haven't received it. This post helps to understand whats going on. I will notify Ripta42, I don't know why this is happening. And if needed, you can always send me an email if there is an issue with the board. I have been a little less observant the last 3 weeks thanks to life getting a little too hectic. I contacted you about this last week. I tried to post a reply and a new topic with an attachments and it wouldn't let me. I got the same message as Frankie. Yes you did, and i did get back to you. What I did not know/understand was it you couldn't post or couldn't post with an attachment. That is why I asked you to post a TEST message, I should have specified without an attachment. I did reach out to RIPTA42 for help as i didn't see any issues, and it is believed to be fixed. Never hesitate to PM or email me with an issue. I can't guarantee I can help, but I will try. The first two views are from MaBSTOA and the last is from NYCTA. 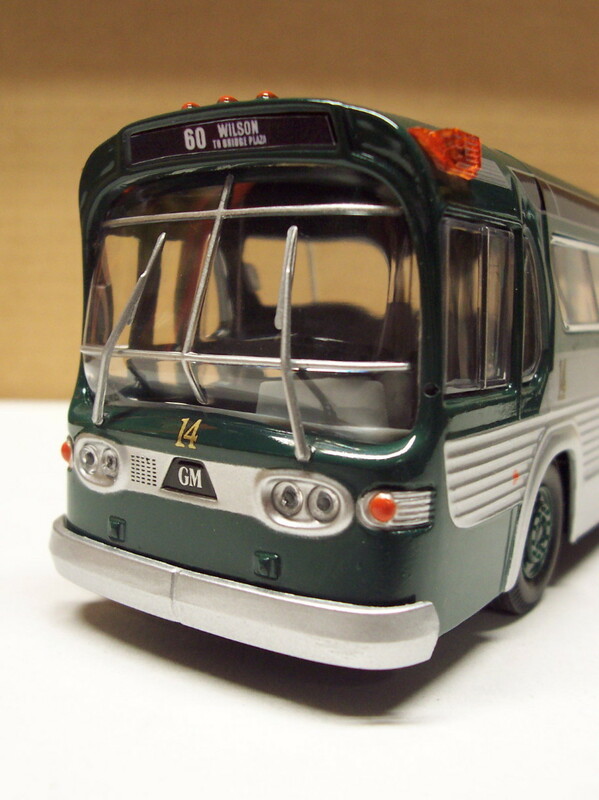 The MaBSTOA buses are TDH-5303s and the NYCTA is a TDH-5301. I know that the first TA New Looks did have this type of destination sign printed on mylar. BTW, just for trivia sake... the MaBSTOA roll signs were by depot. 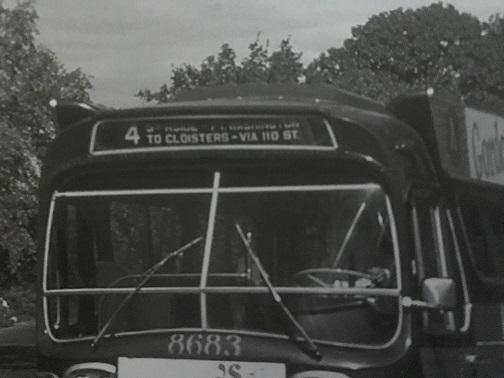 In other words the buses based at 54 Street Depot only had signs for the routes based at that depot and no other. Likewise with the other depots. However, this did not apply to the bat-wing signs. MaBSTOA had all the Manhattan based routes. Not sure about the NYCTA bat-wings since those showed destinations and not routes. 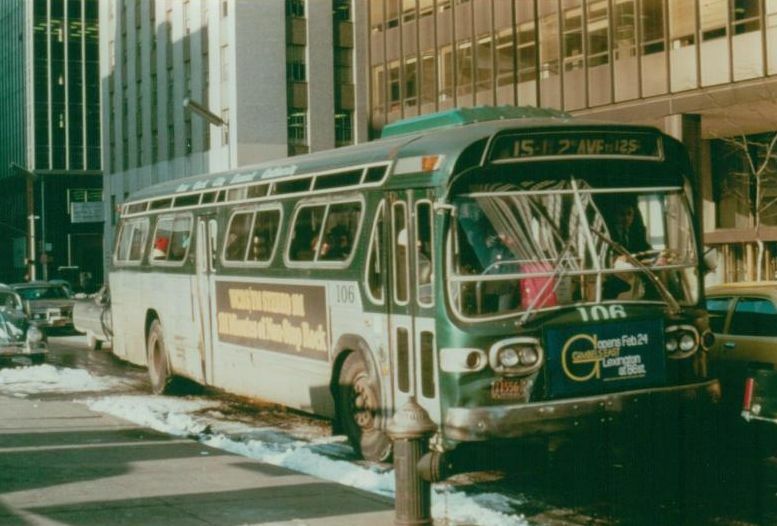 The roll sign on NYCTA 14, like on MaBSTOA 6830, would have been mylar, made by Transign, and thus likely the first for each entity. (MaBSTOA's front roll signs differed from the FACCo/NYCO/ST protocol with split front roll signs, black at left and red at right.) But cloth signs for TA Fishbowls would have also been prevalent in those early years in service. As for side signs for the TA . . . 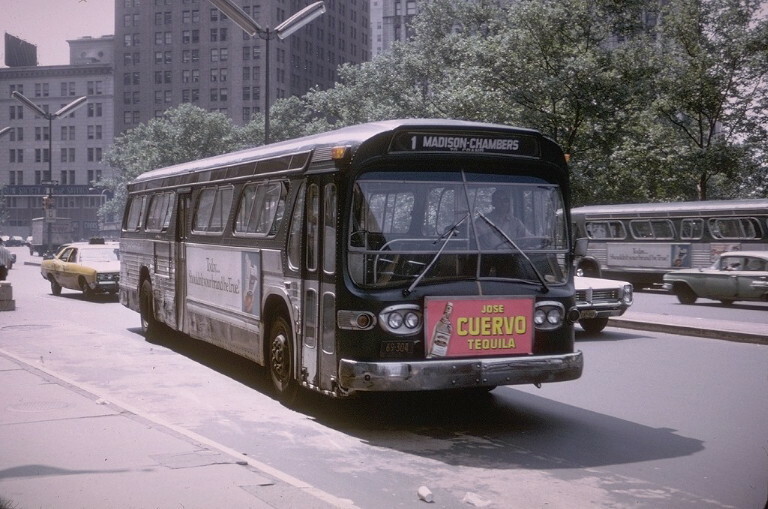 I presume that, for Manhattan, one roll sign would have been for all destinations for all routes as the TA only operated five routes in that borough (M1 - Madison/Chambers, later M22; M3 - 49th-50th Crosstown, later M27 and now M50; M7 - 65th-66th Crosstown, later M29 and now M66; M11 - York Avenue, later M31; and M15 - First and Second Avenues, the only one of their routes to survive the 1974 renumbering blitz), and only one depot to handle them all (the 126th Street depot). Let's hope this works. The example of the Rockaway Pkwy is the one I am looking for. These were the original signs from the '59 order. 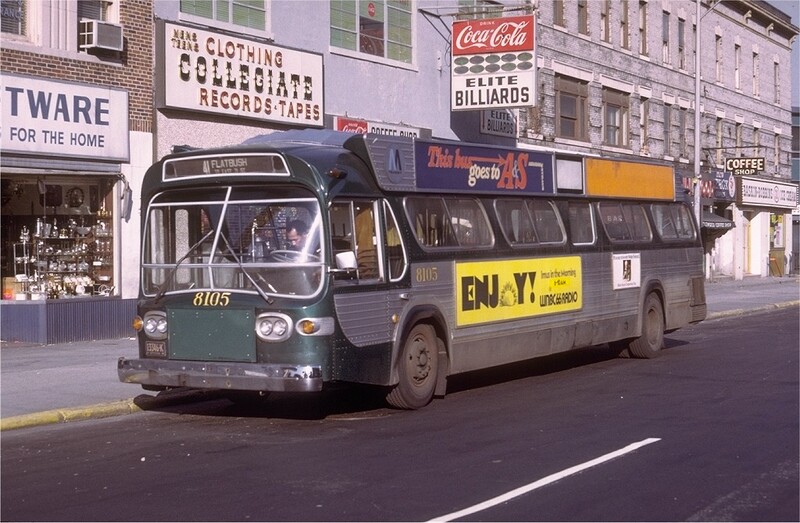 Those types of signs, I've seen on some pics taken between the early '60's and early '70's on those buses plying the M15 route in Manhattan (and some such signs were later transferred to later buses, I saw one such sign on a 'Batwing' fishbowl in the 8000 series. 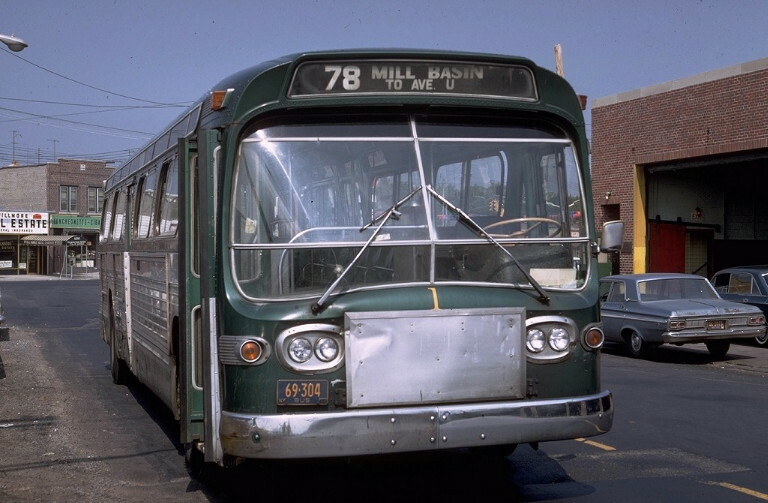 This one was on the original bus to which it had been installed. There are others, I'm sure, but this is a start . . . These are great! Thank you W.B. Fishbowl. This is the custom destination sign I made for my Corgi NYCTA model. Wilson Avenue was just down the corner from me when I lived in Brooklyn back in the '50's. Keep posting new destinations of this format here. Probably not many out here, but one never knows what's on the Internet. 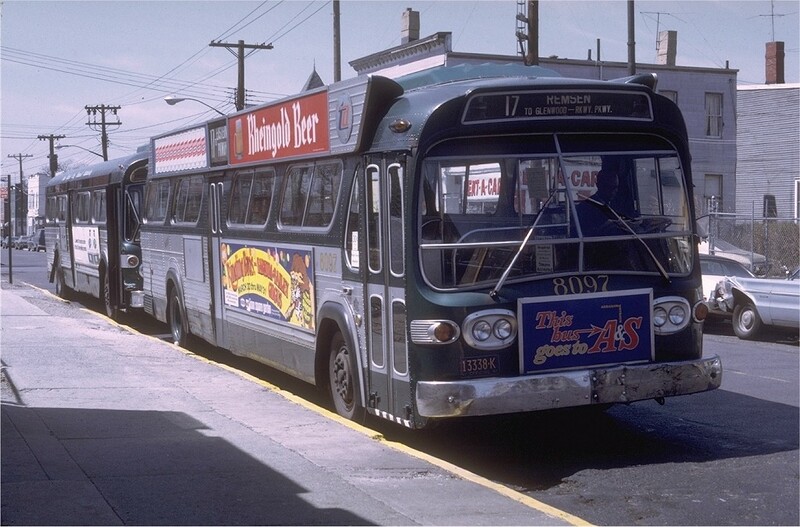 As I've said, some of these old-style front signs turned up on Flxible F2D6V-401-1's. Like here in this 1972 pic (from nycsubway.org) . . .